IT Band Syndrome is a common thigh injury generally associated with running. It can also be caused by biking, hiking or weight-lifting (especially squats). The iliotibial band is a superficial thickening of tissue on the outside of the thigh, extending from the outside of the pelvis, over the hip and knee, and inserting just below the knee. The band is crucial to stabilizing the knee during running, moving from behind the femur to the front during the gait cycle. The continual rubbing of the band over the lateral femoral epicondyle, combined with the repeated flexion and extension of the knee during running, may cause the area to become inflamed. Of all the different type of lower limb sypmtoms out there, ITB Syndrome is perhaps one of the most likely to respond to custom orthotic shoes or orthopedic insert therapy. Naturally controlling pain and inflammation through ice, rest and massage is important. However, consider faulty mechanics from the feet upward as one of the most common causes for this painful condition. Ilio-Tibial Band Syndrome responds well to conservative treatment such as custom orthotic care. 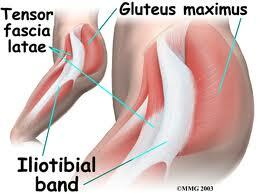 What are the best iliotibial band syndrome stretches? What are the best iliotibial band syndrome exercises? What does ITB syndrome consist of? What are the top ITB stretches & ITB exercises?